Autumn vegan and vegetarian dishes. Autumn has to be our favourite season. The leaves are slowly crisping, turning London a kaleidoscope of Autumnal colours, you’re not quite freezing in a jumper yet, and the hum of Christmas panic is a comfortable distance away. We may even see a few more days of sun! Hearty root vegetables and earthy leaves are in season, making for the perfect comfort food. 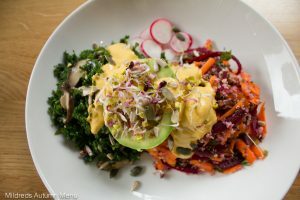 The weather may be getting colder but we have a bunch of vegetarian / vegan dishes that will definitely warm you up, and prepare you for the darkening months ahead. Take a look at some of the seasonal changes we have made to our menu. We have brought back a Mildreds classic, the artichoke crostini, with lemon aioli. It’s a light introduction to a meal and is perfect for sharing with friends. 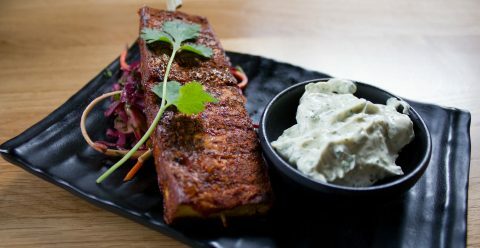 Our head chef Daniel has taken inspiration from Memphis and soaked a tofu steak in bourbon and sticky BBQ glaze. It’s cooled down with a root vegetable slaw and an extremely convincing vegan ranch dip. We have a brand new salad this Autumn and it truly lives up to its hearty title: the Soul Bowl is a duo of super food salads – carrot, beetroot, quinoa, cherry tomato, dates, parsley, mint & Kale, shiitake mushrooms, and sesame dressing served with avocado. What’s more – for every bowl we sell we give 50p to Compassion in World Farming, a fantastic charity campaigning to end all factory farming practices. You can read more about them here. We have also added a salad that you may recognise from our salad bar: the Mildreds Caesar salad (Romaine Lettuce, Croutons, Parmesan, Green Beans, Capers, Tofu Pibil and Caesar dressing) – but now you can order it as a vegan option (or even gluten-free without the croutons)! We’ve roasted a large Romano pepper and stuffed it to the brim with Arabic spiced freekeh. 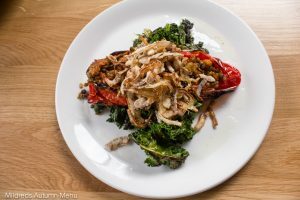 It’s served with pan-fried kale, smoky tobacco onions and tahini sauce; it transports you straight to a humble food stall in the Middle East. Of course the Sausages and Mash has returned! 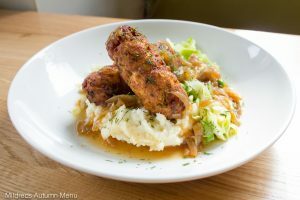 Warm smoked tofu, fennel, apple and white bean sausages sit on top of silky pan-fried cabbage with peas and dill mash. 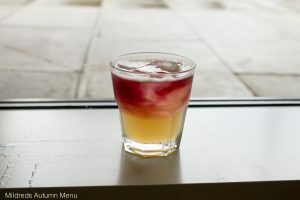 A sweet yet tart cider jus seals it all together. 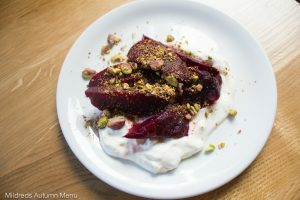 A nod to a classic Persian dish – we soak beetroot in a tamarind glaze before roasting and serving with vegan labneh and salted pistachios. Deep and earthy flavours yet fresh and crunchy – a true embodiment of Autumn. Our development chef, Sarah, has been working hard with her team to deliver an entirely new pudding menu! 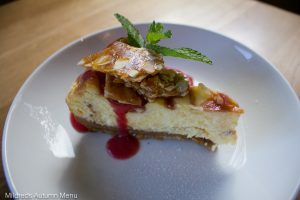 We have spiced up our classic cheesecake with anise and plum and served it with a toasted almond brittle. 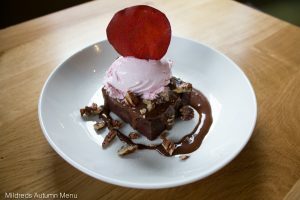 An unusual but delicious addition is the warm beetroot and chocolate fudge cake with chocolate orange sauce, beetroot coconut cream and maple pecans. The beetroot isn’t just there to show off (a la red velvet) – you can actually taste it and it’s delicious! We have sourced the season’s first blood oranges and reduced their juice to make a syrup to serve with our Persian spiced walnut and almond cake. 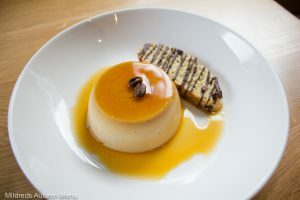 A vegan crème caramel whose wobble is truly a miracle! For the kid in you – vanilla ice cream – but with adult sauce (warm salted caramel and coffee). Last but not least, nothing says Autumn like a crumble – enriched with all the best fruits of the season! We have a cleaner take on an espresso to get you going! Spicy ginger, cayenne pepper and lemon shot with apple chaser. We have also revamped our cocktail menu, take a look at the new additions below. 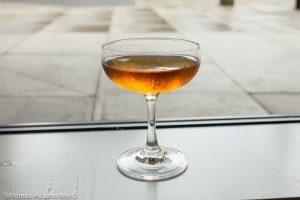 Bourbon angostura and smoked bitters, sugar, orange. Mildreds Soho launches this menu on Thursday and Mildreds Camden on Wednesday.